This one is going to stick with West Linn for a while. The Lions, facing Perth, Australia, in the championship game of the Firecracker Classic at Lakeridge High School on Sunday, led 4-3 entering the seventh inning and got the first out there with J.K. Kelly on the mound. But West Linn's defense, which had already allowed two unearned runs, really came apart there. The Lions committed three errors in the top of the seventh, walked two batters and allowed two more unearned runs to come up on the wrong end of a 5-4 decision. 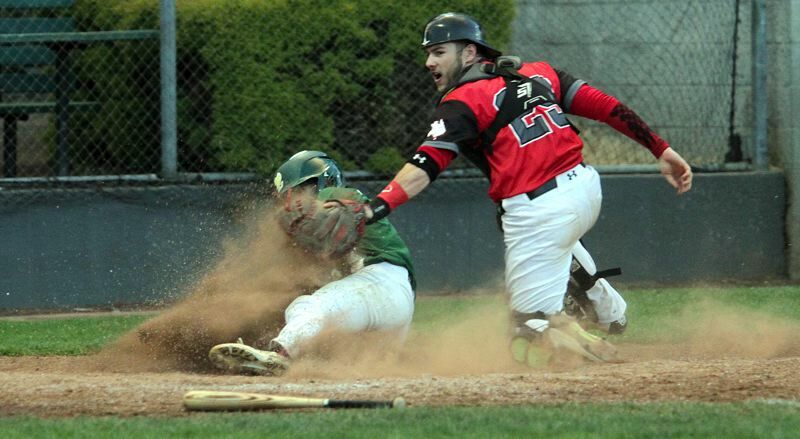 "We did a lot of things right, but what really changed the game is what we did wrong," said West Linn third baseman Zach Bell, who doubled, scored once and went 1 for 4 at the plate. "The big issue was all these errors. We had six errors throughout the game — six errors was a killer. That's not our baseball." After a scoreless first inning, Perth broke on top with one run in the top of the second, getting a leadoff single from Chase Karn, a double to left by Parker Hancock and a sacrifice fly from Hayden Daniels to lead 1-0. West Linn, held in check for the first three innings by Perth's starting pitcher and his upper-80s fastball, stepped up to tie the game in the bottom of the fourth. Bell led off with a double down the left field line, moved over on Clay Masters' bunt and scored when Cormac Duffy grounded to second base. Perth answered with an unearned run against West Linn starter Colin Driscoll in the fifth, getting a leadoff double by Ash Barnes, a wild pitch, and later, a 2-1 lead when Barnes scored on a Lion error. West Linn put the pressure back on the Aussies in the bottom of the frame, however, getting a leadoff double down the left field line from Kelly, who then scored when Perth made a throwing error on Garrett Wiancko's bunt. Wiancko advanced all the way to third base on the throw, then scored on a wild pitch to give his team a 3-2 edge. It was Perth's turn next, tying the contest in the top of the sixth when Karn singled to left, took second on an error and scored two batters later on a bases-loaded walk from Kelly. Undaunted, West Linn took the lead back at 4-3 in its half of the sixth when Duffy reached base on an error, pinch runner Caden Parker took second on Zac Hoover's bunt and scored on Wiancko's opposite-field bloop single to left. In the top of the seventh, Kelly opened with a strikeout, but saw Perth load the bases on an error, a walk and an infield single from Karn. Perth tied the game on an errant pickoff attempt at third, then scored the winning run on another West Linn infield error. "The reason we lost this game was not because we didn't play good enough, it's because we didn't play our baseball," Bell said. "Just like any game, it all comes down to execution. This game, we did not execute in key situations. We had too many mistakes in the field. That's what really did it for us." The Lions managed a single baserunner in the bottom of the seventh, but failed to score. For the game, Kelly was 1 for 3 with a double and one run scored, Wiancko was 1 for 3 with one RBI and one run, and both Parker Stevenson and Masters went 1 for 3. Driscoll threw 5 1/3 innings, allowing five hits and two walks while striking out one. For Perth, Karn went 3 for 4 and scored twice. No other Perth player had more than one hit.